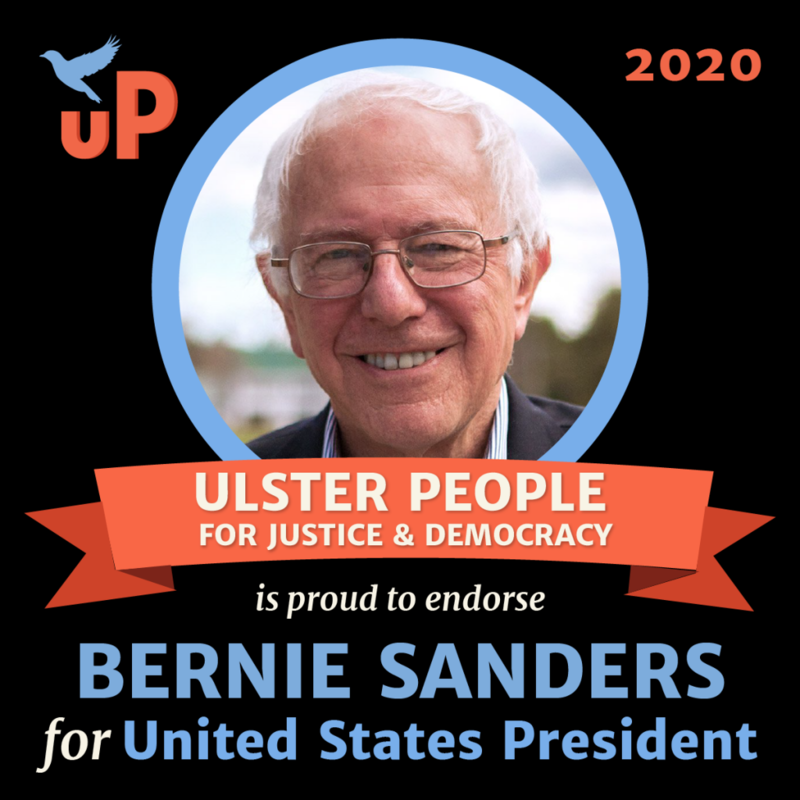 Ulster People Endorses Bernie Sanders for President! Rosendale, NY – By a huge majority, the members of Ulster People for Justice and Democracy voted on Monday night to endorse Bernie Sanders for President. aftermath of the Sanders presidential bid in 2016.
political races; with their powerful grassroots connections and multi-pronged approach, UP volunteers were a key contributor to the election of a wave of Democrats to the Ulster County Legislature in 2017. Now members of Ulster People are eager to focus their energy on a presidential campaign again. “Bernie’s platform aligns with my values and his candidacy promises much needed excitement and optimism,” Penny Coleman, UP member and Vice Chair explained. With this endorsement of Bernie Sanders, Ulster People positions itself as the organization providing local support and local structure to the Sanders campaign. UP members are seasoned grassroots activists familiar with the turf that needs to be covered for Sanders to succeed. Bernie Sanders won 63% of the vote in Ulster County in the 2016 Presidential Primary; with the added energy of people joining now, UP plans to do that well or better in 2020. For those interested in volunteering for the Sanders campaign locally, Ulster People for Justice and Democracy can be found at https://ulsterpeople.org. The combination of Ulster People’s experienced volunteers and the activists who join now will make a formidable force here in the Hudson Valley. Posted in elections, endorsements, Press ReleaseLeave a Comment on Ulster People Endorses Bernie Sanders for President!